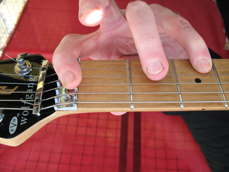 The memorisation method now known as the CAGED guitar system has been around for some considerable time (not originally known by the acronym CAGED); first being encountered by myself in the July 1984 edition of Guitar Player Magazine. 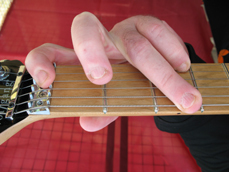 The article was entitled "SCALE SYSTEMS - Open Up The Fingerboard By Speed-Processing Melodic Elements" by the then deputy editor Jim Ferguson. 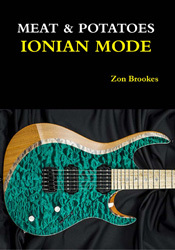 A new guitar method book, based on a modification of the CAGED guitar system, using octaves rather than chord shapes. 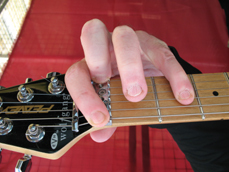 The method allows complete fretboard freedom for standard and 3 notes per string scale & arpeggio box shapes. 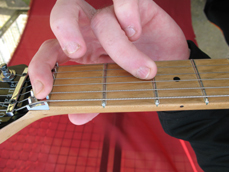 The standard CAGED guitar system links together the five basic open major chord shapes - C, A, G, E and D (in their barre forms) to produce a fretboard navigation system. 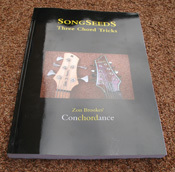 This standard CAGED guitar system works very well when the scales, chords and arpeggios being considered are major in nature, however it tends to fall down when the scales etc. 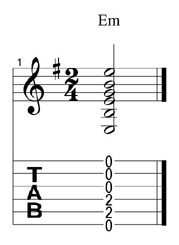 are minor in tonality (as the Cm and Gm shapes are difficult to play especially in their barre forms). 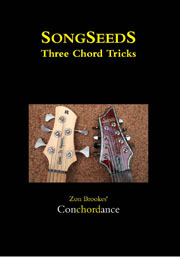 All the tabbed panels that follow show a photograph using the "players eye view" format, Guitar Pro fingerboard (with note names plotted) plus the tablature and standard music notation for the Cm, Am, Gm, Em, and Dm open chords. 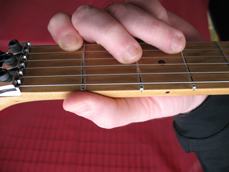 As the improvising guitarists favourite scale is the pentatonic minor this difficulty with Cm and Gm can be rather inconvenient, thus a second system has developed known as EDCAG (click-on link for details). 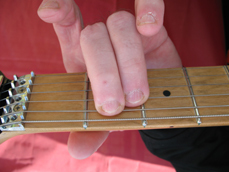 The E shape is then referred to as Shape 1 - as this is the shape that is located at the nut for E pentatonic minor (the rock guitarist's favourite key for improvisation). 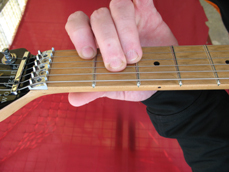 CAGED octaves eliminates this problem as octaves are played (either singly or doubly) rather than Em, Dm, Cm, Am and Gm shape barre chords (but chord shapes are demonstrated for completeness). 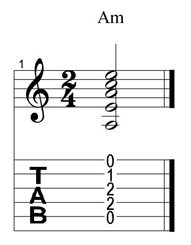 The tabbed panel below shows the five CAGED octaves shapes positioned at the nut where the shape name and sound both correspond to one another (this will not be the case when the shapes are used for other notes). 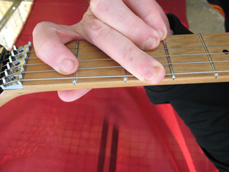 Fingers are positioned on top of the nut to illustrate where open strings are being sounded. 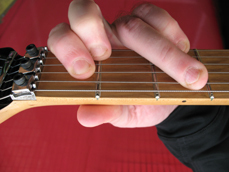 Additionally the system has been modified for use with the three notes per string scale shapes (sweep picking) which produce seven shapes known memorably as Patterns I, II, III, IV, V, VI and VII. 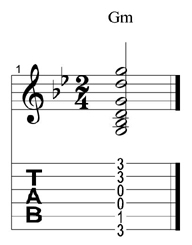 As illustrated by the CAGED octaves circles shown above the word CAGED should really be represented in a circular fashion - with the letter that points north being the starting shape located at the guitar's nut. 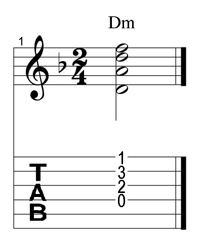 The examples on the remainder of the website are in the easiest of keys - A minor; hence the CAGED octaves letter order is AGEDC. 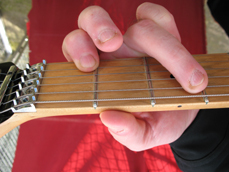 The large orange letters represent the underlying chord shape (as they sound at the nut) i.e. C, A, G, E and D.
The green boxes are the root notes. 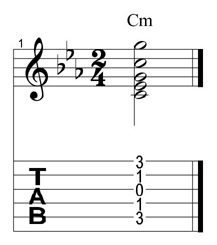 The numbers in the green boxes represent the string numbers 1 to 6.